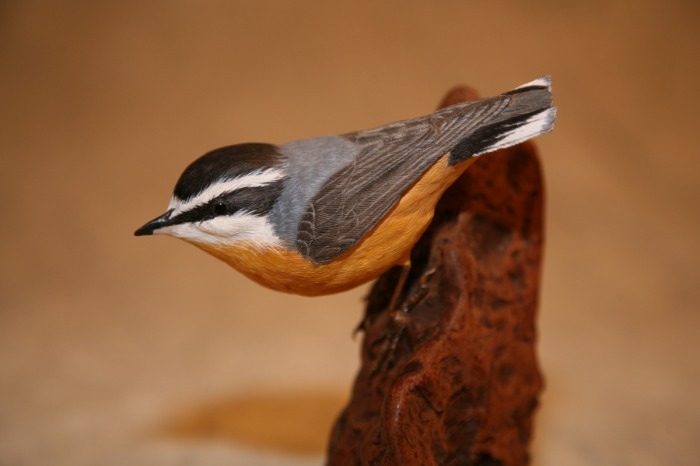 This website highlights my carved realistic birds. The carvings are wood (most often tupelo), and painted with acyrlic paints. Each carving is an attempt to show the beauty of the bird, and is a unique, one-of-a-kind sculpture, with attention given to detail, colors, and suitable habitat. My aim is to sculpt birds so lifelike that you might think they will fly away if you touch them. Through my carvings, I share the beauty of nature, hoping to remind others to pause and experience the wonders and beauty of our world. I have been asked how the name "Feather By Feather Bird Carvings" came to be. Briefly, one of my grandchildren asked how I carved my birds. I replied "I carve them feather by feather." When it came time to pick a name for my carving business, the name seemed like a natural. All the photos can be enlarged by clicking on them. The Blog contains occasional random blogs about bird carvings, birds, the carving life, and other topics. Hopefully, you will find something of interest in these blogs. Please also visit my FaceBook Page at Robert A. Wasmer - Feather By Feather Bird Carvings. "All things bright and beautiful, All creatures great and small, All things wise and wonderful: The Lord God made them all. Each little flower that opens, Each little bird that sings, He made their glowing colors, He made their tiny wings." Last updated: October 25, 2106.